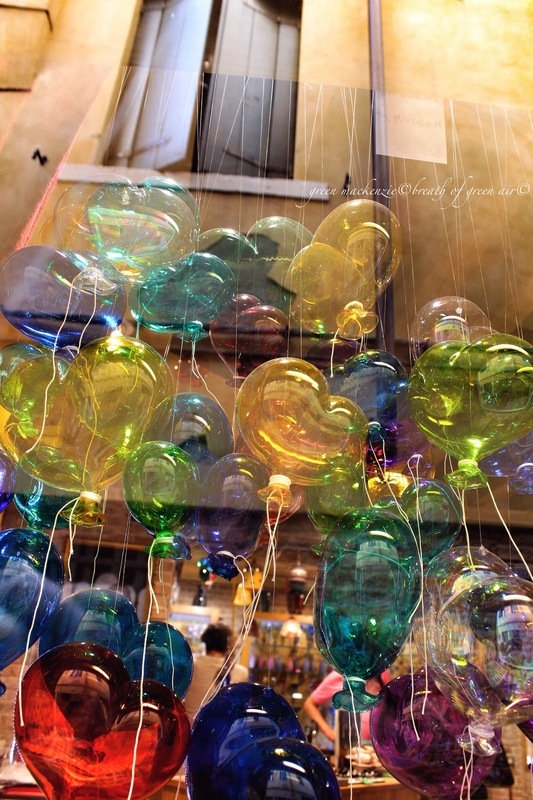 This entry was posted in art, mindfulness, weekly photo challenge and tagged balloons, dreams, love, magic, mindfulness, photography, postaday, Reflections, travel, Venice. Bookmark the permalink. Thats so true Mabel, slowing down and appreciating the wonderful things which are already there around us, just waiting for us to notice! And it was impossible not to smile and feel happy looking at the colourful balloons! Just gorgeous – so glad you didn’t miss this moment. I’m off to Venice in a few days – tralalala! You are so right when you say, “Nothing looks quite the same in Venice.” Although lots of people suggested it was too dirty a city to visit, we fell in love with its decayed elegance and its dark corners. The light off the balloons is beautiful in your photos. Its funny, I got that reaction too when I mentioned we were going. Lots of people said it would be smelly, but I didnt find that at all. I was swept away by the soft shabby decay encased in impossible elegance. It was a winning combination for us….perhaps you and I just like shabby chique!! 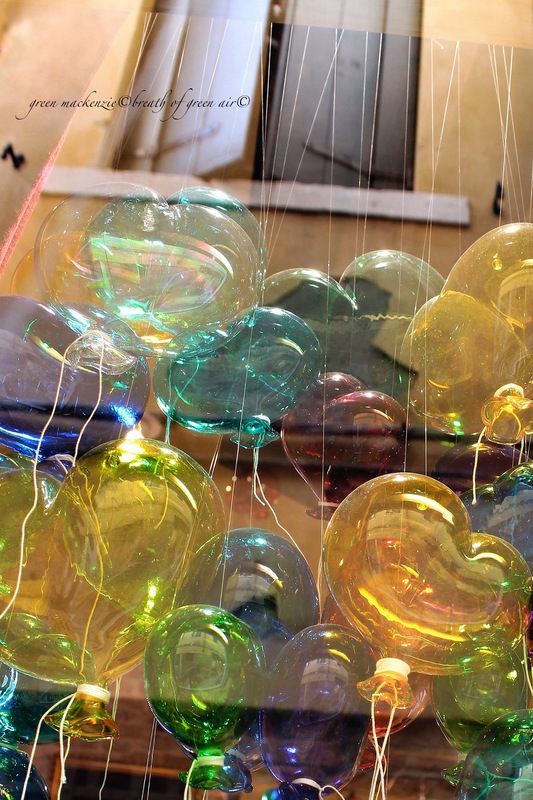 Venetian glass balloons! Love them and your photos! Beautiful shot, Seonaid. The colors seem really delicate! Oh my gosh! Those pics gave me goose bumps! How in the world do they float upwards if they’re made of glass? Oh I see, they’re suspended, not floating upwards. Still, gorgeous! Great submission! love the color composition! How absolutely gorgeous – what a wonderful sight to see. It was really pretty, but was up against stiff opposition with Venice as a backdrop! How absolutely gorgeous! A wonder they did not break – glass? Beautiful, beautiful shots, Seonaid! I’ve been to Venice only twice – but never did I see them…Looking at the first photo I first thought they were not real, that the photo was put together in twos or something. Unreal! Such gorgeous images, especially that first one, with all its vivid colours 🙂 And beautiful words, that concept of each of our reflections imprinted on these mere moments, each one held by that strings of ours, or that decision of either holding on to or letting go of our dreams. How true, just love your perspective, in both photographs and life! You really nailed this one Seonaid – what a gorgeous collection, beautifully capured and made more wonderful by your text. Great post as always. Thanks Andrew, I’m delighted that you enjoyed them….a heart healthy treat! 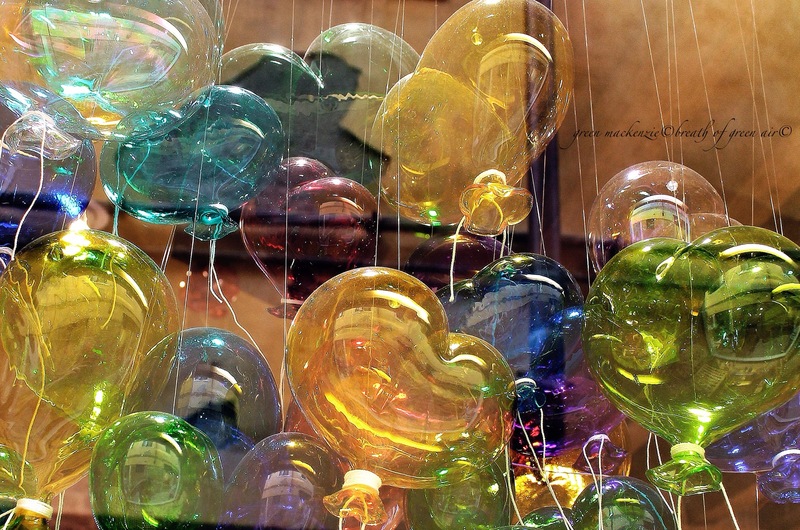 Yes, im certain that the fairies must have had a hand in creating floating glass heart balloons…. It listed them as Glass Balloons! I didnt know the link with Venus, but that makes perfect sense, thank you. aww, hearts of glass… beautiful!! They are dreamy arent they Alexandra, but I suspect quite fragile too! Wow Rachael, what a generous comment, thank you! Great take on! Gorgeous colors and perfect lighting! Love these two photos. Thanks Amy, each time I look again at them I smile….and then of course there are the memories brought back. Oh I know Gilly. It did cross my mind to buy one, but I couldnt find any price tags, so I allowed my husband to walk me on past the shop empty handed….but with some lovely images. The images are easier to get home in one piece! Very delicate and beautiful, Seonaid. They did look so delicate Marion, and the colours were even better in the flesh as it were. I think they might have been murano glass, but I couldnt find any signs…..or prices! I know, its so easy to miss things when you are somewhere new and surrounded by so many wonderful old buildings. It was such a creative window display, but even so amongst the glamour and magic of Venice it had lots of competion for attention! These are so beautiful. I love the first photo.